“”I need not tell you that the dark hand of Nazism has been reaching out across Europe snuffing out the lights of freedom to which all civilised men are accustomed. Our brave Russian allies have suffered much in recent months but stand resolute in the face of the Fascist foe and have been gathering their strength to face their own Darkest Hour. Today I have received a Communique from them which has lifted my spirit and so I announce to you tonight that our distant allies have launched an attack that has dealt the Nazi forces a mortal blow. An overwhelming force of arms has destroyed 20 enemy divisions and our allies’ resolution and might is such that they will not stop until the very gates of Berlin are shaken by their vengeful blows. Back now to our scheduled program The Glenn Miller Sound………. Finland; Reinforcements delayed by German rail disruptions reach to within 20 miles of Kandalaksha and form up to block the German advance although Murmansk remains cut off. Leningrad Front; Partisan reports indicate a build-up of enemy troops to the south of Leningrad and Brandenburger units are identified. As a pre-emptive strike the Soviets launch an attack against Dno cadreing the German infantry division defender and taking the city. Elsewhere the front is consolidated with new arrivals. Moscow Front: The exposed NW city hex is reinforced and the shattered defending Guards units pulled out of the line to rebuild. Along the line south to Tula fresh troops man the barricades allowing Guards and Winterised units to pull out and move south. Voronezh Front: The previous attacks on this sector have achieved the objectives of sealing the gap in the front line, securing rail junctions and putting the Axis into a defensive posture. The Politburo just settling into their new headquarters at Kuybuyshev judges it is time to launch their winter counter offensive. They expend a Resource point to boost rail capacity and the newly designated 1st Shock Army which has been gathering is supplemented by winterised troops pulled out of the line elsewhere and newly arriving reinforcements. The Army fields 40 divisions and an equal number of brigades and regiments including artillery, rocket, and tank brigades. Approximately 40% of the troops are Winterized. The Army is arranged in two echelons. The first the Attack Force, the second the Reserves designed as a mobile reserve to instantly replace losses from Exchanges, and with strong mobile formations built around a few remaining Tank corps and motorised brigades to provide an exploitation capability. The Soviet plan calls for a broad front attack between Tula to a mid-point between the Kharkov and Kursk latitudes. 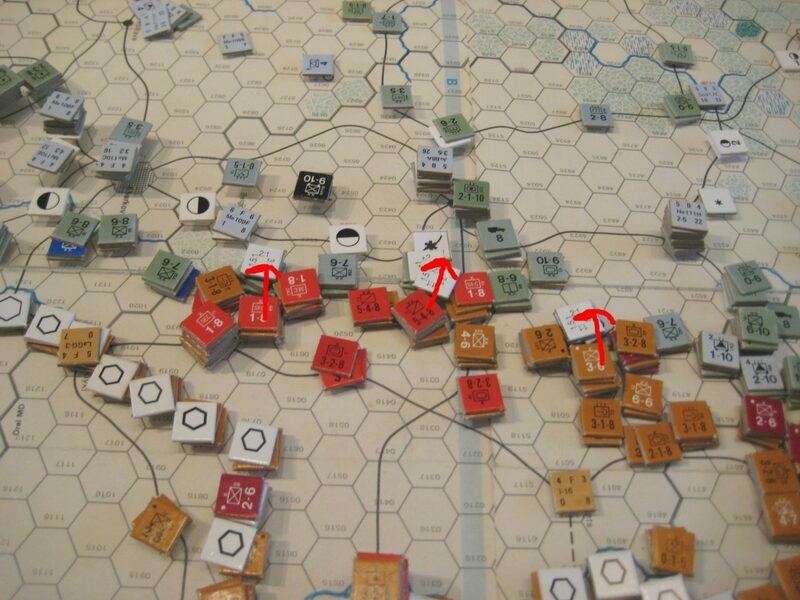 Like a great opening door hinged at Tula the left flank will wheel Northwest along the axis Kursk, Bryansk, Smolensk securing the left flank while the right flank closes on the Western approaches to Moscow. After the Axis commit their reserves to the main assault a secondary thrust by an as yet unformed army will strike south from Dno towards Veliki Luki and Vitebsk trapping the German attackers. The Attack echelon launches 3 attacks against triple stacked German infantry divisional Hedgehogs at 2:1 with Half Winterisation. The attack is a complete success cadering 8 out of the 9 divisions engaged (plus eliminating a Luft AA unit) for minimal losses in a Half Exchange. Rostov Front; All is quiet although the fortification of the line continues towards he coast. Crimea: Defenders brace themselves for the Axis attack and reinforcements and resources are railed to Novorossiysk for the sea journey to bolster the defences. Air War: The soviets are not about to cede control of Moscow airspace to the aggressors and launch an Attack Bomber raid on the German airfields north of the city. German patrol attacks are utterly futile and turn back none of the bombers or fighter escorts. A second large battle forms north of the city with a total of 40 aircraft engaged. In the end 3 more soviet Fighters are lost including the first Guards aircraft casualty of the war; plus 2 aborts. The Axis loose a German machine plus the Italians brought down by an obsolete I-16 brought in the replace last turn’s losses. The Germans also suffer 2 Aborts. A Yak-4 succumbs to accurate light combat AA. The surviving Soviets however fail to score a single hit on the Airfields! Elsewhere the Soviets launch a series of long range bombing raids against the German rail net to support the 1st Shock Army’s offensive but fail to inflict a single hit.